Thoudam Kishore asked his neighbour "Noi bhabhi leibro... ? " Sanasam Lata replied "Leite.. same ga angoorga Leiganena Market chatkhiye..". Does anyone feel unusual after reading the above lines; I believe maximum didn't because we are associated with this often. Now let's do some calculation. The above words are commonly used nowadays. Out of the 10 words a total of 4 words are foreign or non native which constitute 40 % in the above conversation. But the question here is "Are we short of vocabulary or we have no option other then to borrow from others". From the name of a person itself we have been inclined towards imitating the culture of others forgetting our own identity. I won't run away from the fact that even my name connotes a different identity and it seems we are buying something which we don't require. The expense here is tantamount to self exploitation which is a threat to our own heritage. Now someone may not agree with me why this becomes an issue when the world is looking beyond the Galaxy and Globalization and Civilization stands together. But if the world is so advanced and name itself is not so important then why can't anyone be called Osama bin laden or Adolf Hitler or may be Saddam Hussein. Wise people didn't because they feared that their identity would be mistaken. When I was in Delhi my colleague asked me what do you called grapes in Manipuri? , I definitely have no answer in that except to replied "its the same with what you called in your language"
And from that incident I feel the pinch every now and then. The theory of cultural assimilation and its advantages cannot be practical if we become what we are not. That's why I bring out the importance of a name and the losing vocabulary of our language. Sometimes words are limited to explain the feelings, it is this feeling that intended us to take words from others so as to make communication complete. But at that point of time we failed to understand to generate or restructure our own existing language so as to maintain the originality. Yes, there may be some problem to this, lets consider for an example the native word for Apple. Till yet, we don't have any such name but we have for other fruits starting with Hei.. Heicru, Heithum, Heimang, Heitup, Heikha, Heiyai, Heinoa. But for apple can there be any such type. Such prefixing with only Hei has made ourselves unexplored and constricted. Let's look again for the other type of fruits : Nobap, Malhei, Mangey, Charfon etc etc.. They don't start with Hei.. but very well absorbed in the text of our literature. My intention is that yes, if we explore we can name certain things in our own language without having a degree in Nomenclature. It is true that the Change is Nature and Nature itself brings Change, but the question here is what type of Change? A positive change or a deviated one. When one culture is challenged by an external attributes it brings a negative impact and lost of identity and dysfunctional. It is here to bring the importance of language that can brings a negative change in the society. Such change can be seen in within the domain of one own tradition and generally in immaterial things where the origin is from overseas. It is an added quality, no doubt, learning an additional language which is always an advantage but things might become different while the freedom to substitute or replace the existing language by other foreign language happens without examining and thus accepting permanently. While change is for an up-liftment or for own conveniences the process cannot be happened overnight as such there is a chance to control it before a permanent structurally shift took place. It is undeniable that some of the terminologies are new which never before had in the text of our own literature but others are coming in substitution with the existing ones this is a matter of concern and it is seen that that the influx of foreign language is so fast that in the coming generation we will not be able to claim our rightful identity. Here the definition of language only as a mode of Communication will be incomplete it also represent an identity and can also be taken as a gift to know the rich history and to learn the intangible heritage. We all agree that this planet is blessed with homo sapiens which ruled at its own pleasure and in order to maintain the harmony among different races language were choose for a better communication, so a person who knows to speak other language cannot be term as wise unless s/he respect and maintain his/her own language. That was the reason during the early century many European countries tried to impose the importance of their own language in the vocabulary of other race , the result is now that many countries used the literary works of Spain , Greeks, Latin, English, France and forced to construed that these languages are more advanced then the other. which is slowly substituting our existing words . Is it because of our mindset towards looking on the western side of our state or improper education or because of political factor or one sided globalization? The right answer is very simple and that is "we have lost our self respect". My imagination is not a case of regionalism but a fear which I feel for my daughter for my race for my identity and for respect of tradition and for the existence of our society. Now nobody cannot answer How gobi comes in prefix to gobisark, gobifull, How aturkulap, gula, atta, maida, alloo, daddy, mummy, samaj, rajniti. Santi, cycle, Bhai bondu. Bhabi, boroi, samudra, jahaj, ejat, vartin, adhikar, latrine,station, parking, dukan , saboon, fan, riskshaw, college, school, jersey, gas stove easily absorbed in our conversation. We have forgotten the use of Konung as the capital of a state and country instead we easily used Capital and it is not out of proportion, actually, we have failed to define the meaning of development, we have failed to define ourselves, we have accepted the dominance of other language to our culture willingly. 1. Vulnerable: Speaker restricted to certain domain and most children speak the language. 2. Definitely endangered: Children no longer learn the language as mother tongue. 3. Severely endangered: Spoken by grandparents and older generations, not spoken among parents and children. 4. Critically endangered: The youngest speakers are grandparents and older and they speak the language partially. 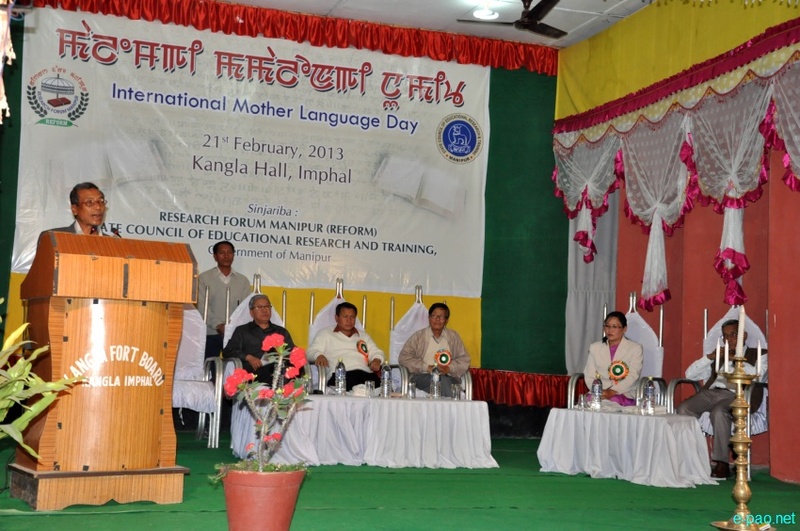 Now the sad NEWS is that in the above categories the Meitei language falls in Vulnerable language, so sad right..? But it's our fault and with a population of 28 lakhs it cannot be an excuse and we cannot blame anyone. The rest is your decision before it's too late…..